Recommended to: Readers who enjoy stories based around cults, and are okay with reading about tough issues. At fifteen years old, Pearl is finally old enough to be chosen as Papa S.'s companion. She feels excitement . . . and surprising trepidation that she cannot explain. The arrival of a new family into the Seed community—particularly the teenage son, Ellis—only complicates the life and lifestyle that Pearl has depended upon as safe and constant. Ellis is compelling, charming, and worldly, and he seems to have a lot of answers to questions Pearl has never thought to ask. But as Pearl digs to the roots of the truth, only she can decide what she will allow to come to the surface. Lisa Heathfield's suspenseful, scintillating debut features a compelling voice that combines blithe naïveté, keen observation, and sincere emotion. Let it be known that I have a weakness for books like Seed. Any time a book is placed in front of me that revolves around a cult, and the life of its inhabitants, I have to read to it. Absolutely must. There's something about these stories that both terrifies and intrigues me. That one person can have that much power, that one single human being can manipulate others into worshiping them, it's something I am fascinated by. So it's no surprise that the moment this book was offered to me I snatched it up. I knew Seed would be something I'd want to experience. In my past experiences with books like this, the one thing that stands out is how well an author deals with all the tough aspects of the society in question. We all know that things go on in cult societies that aren't exactly easy to stomach. That, quite often, there are children at the center of these stories who are put in very uncomfortable situations. In that vein, I have to applaud Lisa Heathfield for expertly navigating this territory. While all of the items I was expecting were definitely present, they were handled with care. I was still able to see into Pearl's world, still privy to her questions and issues, but I never felt that it was over the top. I think that's important for a young adult book. Speaking of Pearl, it was the characters that really made this book shine for me. Although I couldn't agree with Pearl's outlook on her situation, I understood. 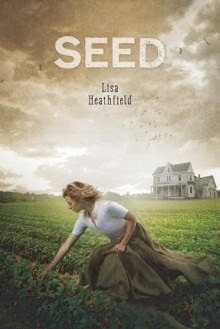 Lisa Heathfield brought to life a girl whose whole life was Seed. A girl who knew only the boundaries of what to her was a safe and happy home. A naive girl maybe, but one who had no reason to be otherwise. I felt for Pearl, and for the rest of the characters. Each one of them was real to me. It made this a much tougher read, to be sure, but one that also felt much more fulfilling. I've never wanted to have the power to yell at characters more than I did while reading this book. Long story short? This was a very well written and, surprisingly (considering the content), easy story to sink into. Had I not needed to sleep in order to function at work the next day, I would have read this through in one sitting, no problem. I can't say that Seed is a happy story. Don't go into it expecting that. I can say that it's an important one though, and that I am glad that I experienced it.